today’s global commerce involving email, mobile devices, and collaboration tools like Dropbox®, O365™, and SharePoint® . 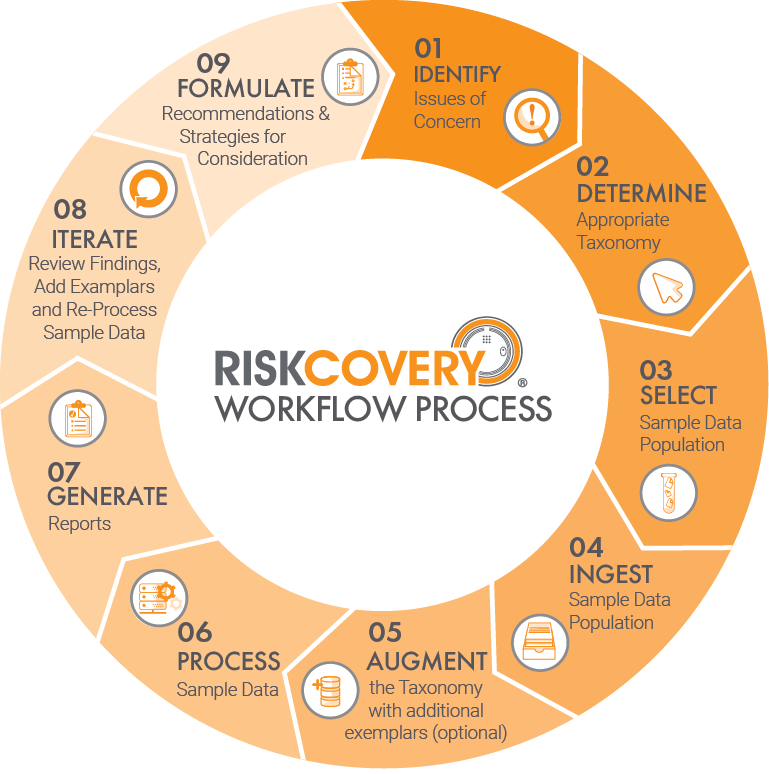 Riskcovery is a platform designed to help investigators and compliance auditors identify risks early, comprehensively, and cost-effectively ― enabling clients to take action to understand the risk envelope and address situations well before more formal investigations, inquiries, or audits are triggered without the traditional eDiscovery expense. Connect to popular data sources such as enterprise email platforms, Dropbox®, O365™, and SharePoint®, among others to audit data-subsets for relevance. Identify data populations that require special handling / forensic methods. Review early findings and further expand or narrow the approach to achieve the optimal understanding of the risks or issues. Communications and files of material substance can be reported and exported for other workflows. Prioritize collection efforts and assess the most critical evidence. Refine legal hold strategies and ensure appropriate issuance. This intelligent risk management capability is at the core of our Riskcovery platform. Riskcovery is a patented, proprietary technology that uses advanced analytics to identify risk early. Using a pre-deﬁned taxonomy which describes speciﬁc ideas of interest, Riskcovery ﬁnds and categorizes materials with similar meaning. Riskcovery can connect to email servers and can ingest ﬁles from Dropbox, Gmail and Google Drive, or from any Windows-based ﬁle system. Additionally, ingestion of mobile device data in the form of Oxygen and Cellebrite XML ﬁles is supported. Data Analysis with Riskcovery can dramatically sharpen the focus of internal investigations by quickly identifying potential ethical or procedural issues. Its unique analytics engine functions without the need for dictionaries or thesauri, so Riskcovery can assess documents in any language. Your Riskcovery expert advisor will work with you, your Counsel, and your Compliance Officer to identify an appropriate representative sampling of corporate documents and email. These representative samples are then imported into Riskcovery and used to identify documents that are conceptual “matches”. If a customer wants to augment their samples with other related topics or samples of interest, the advisor then applies a pre-defined taxonomy to enhance assessment results. Our pre-defined taxonomies include Foreign Corrupt Practices Act (FCPA), Departed Employee Protocol and sexual harassment, or a custom template created to address your specific GRC requirements using additional documents from your own corpus, or from any data source in the world. Documents which conform to the taxonomy concepts are categorized for further review and re-analysis. An integrated dashboard provides data visualization to reveal patterns and trends and reports can be generated to support the Riskcovery analysis and findings.